This is the time of year where people have made the decisions on the changes they want to introduce into their life. Often this involves goals around their health and fitness, especially nutrition. This weeks blog is here to give you some advice and tips on how to create those new years goals and also how to stick to them. Make sure you have something to work towards! Have a read of this previous articles before setting these goals to give you a solid framework of everything you want to achieve this year! Choose objectives that you know you can stay consistent with. It took more than one day to get out of shape and its going to take more than one day to get back into shape. The objective here should be long term progress not short term perfection. Don’t be like a bat out of hell and over do it. Training hard is important, however training smart allows you to train hard with consistency and that is where the real results are found. Imagine you asked a full time smoker to quit cold turkey from the 1st of January – highly unlikely that would stick. With things like a large schedule overhaul to get in these workouts and a complete overhaul of your nutrition it is so difficult to stick to hence why most fitness new years resolutions are out of the window by March. I recommend that you simply make an absolute maximum of 3 changes over the course of a month or more to your nutrition over January. Eg: Increase Protein intake to 1.5g per kg of body weight. Drink 2 Litres of water a day. Commit to two workouts a week or a simple lifestyle change as swap elevators for stairs every time, It can be as simple as that. Build on these goals over time. Set one on the first week then the second week add another and make sure you stay consistent with them. Once January is over and you have stayed consistent, only then can you think about adding some stacks to the pile for February whilst maintaining Januarys changes. This way you can see gradual and controlled improvements built for the long term that you can sustain for the rest of your life. This graph to the right is a great example of this. 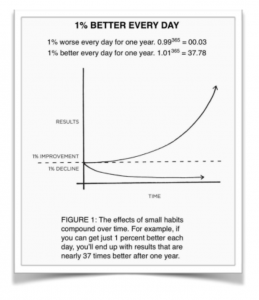 If you get 1% better every day, by creating small, sustainable changes over time, by the end of the year you will be 37 times better from where you started. Another way to keep your consistency is find a training method and style that suits you and most importantly you enjoy, because I cant stress enough the importance of being able to enjoy the changes you are making. If that means it has nothing to do with being in a gym then fantastic, if it means playing a sport you love a few times a week to start with then fantastic. If you are not enjoying your training, the motivation to keep training long term is going to decrease more and more over time, and if you aren’t having fun then what is the point? Find something you know that you can consistently do over time. Good luck with whatever you choose to improve! Just remember that consistency is key!